WPH Press: The 59th Annual USHA National Junior 4-Wall Championships kicked off this afternoon in beautiful Tucson, AZ, home of the United States Handball Association. 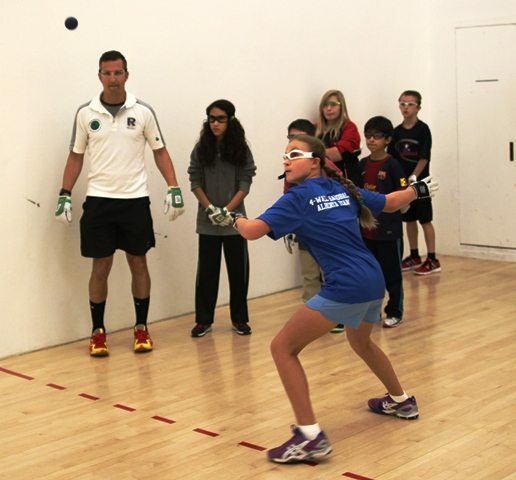 Players from throughout the U.S., Canada, and Ireland filled the Tucson Racquet Club courts for first day of big ball action and an exciting junior handball clinic. Fred Lewis Foundation Head Coach Abraham Montijo, FLF Offensive Coordinator Sean Lenning, and WPH Master Instructor David Fink led and enthusiastic group of 16 junior players between the ages of 9-16 in a three-court clinic, emphasizing the sidearm stroke, back wall technique, serve and return of serve, and mostly how to have fun on the handball court!